Retail gets a win. The sector rallied on higher hopes for the second quarter, giving the rest of Wall Street a boost and pushing the Dow Jones Industrial Average to log a record close for the second day in a row. The Dow added 0.10%, enough to clinch a new record of 21,553. The S&P 500 added 0.19%, and the Nasdaq rose 0.21%. Target rose more than 4%. Other retailers took Target's lead. Macy's Inc. (M - Get Report) , Kohl's Corp. (KSS - Get Report) , Nordstrom Inc. (JWN - Get Report) and Gap Inc. (GPS - Get Report) were higher, while the S&P Retail SPDR ETF (XRT - Get Report) increased 2.3%. Walmart Stores Inc. (WMT - Get Report) , up 1.5%, led the Dow. J.C. Penney Co. Inc. (JCP - Get Report) increased 7%, caught up in the retail rally and also climbing on its announcement of new toy stores. The retailer will open toy shops in all of its brick-and-mortar locations in order to continue to explore new merchandise categories and differentiate its business. The toy shops will be strategically placed near the retailer's Disney Collection (DIS - Get Report) and feature an extensive selection of toys for kids of all ages including dolls, action figures, race cars, arts and crafts sets, and board games. Healthcare names were under pressure on Thursday after the Senate GOP released a revised repeal-and-replace bill draft. The new draft includes an amendment from Sen. Ted Cruz which allows insurers to offer cheap, bare-bones insurance plans so long as they also offer Obamacare plans. Major industry names such as Johnson & Johnson (JNJ - Get Report) , Novartis AG (NVS - Get Report) , Pfizer Inc. (PFE - Get Report) , Merck & Co. (MRK - Get Report) and Sanofi SA (SNY - Get Report) were lower. 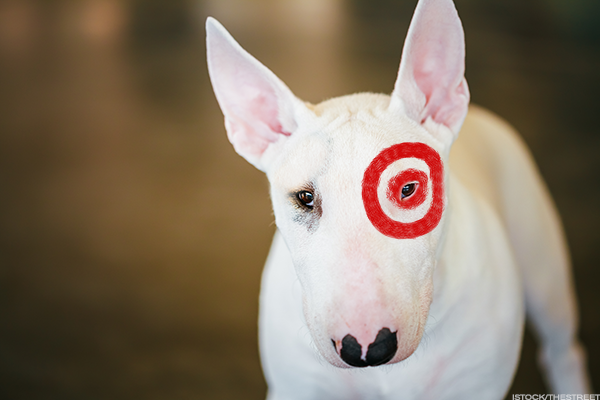 Target helped retail stocks on Thursday. West Texas Intermediate crude added 1.3% to $46.08 a barrel Thursday. Delta Air Lines Inc. (DAL - Get Report) declined nearly 2% after falling short of profit estimates in its second quarter. Adjusted earnings of $1.64 a share missed estimates by 2 cents. Revenue increased 3% to $10.79 billion, but fell short of $10.82 billion consensus. By region, domestic revenue and Latin America revenue rose by 4.4% and 14.1%, respectively, while Atlantic and Pacific sales declined by 0.6% and 12.9%.